The Star Wars universe, not unlike superhero comics, has built up a massive amount of continuity over its 35-plus years in existence. The "Expanded Universe" -- a tapestry of Star Wars stories that take place around the events of George Lucas' film trilogies, in novels, video games, RPG sourcebooks, cartoons, Underoos, etc. -- is full of X-Men levels of offspring; progenitors; ancillary characters whose names contain too many unnecessary apostrophes and not enough vowels; and divergent storylines set in a myriad of time periods that range from the dawn of the Sith Empire to the exploits of Luke Skywalker's space-mulleted grandson. If somebody wants to read a comic featuring the recognizable characters from the Original Trilogy doing cool space stuff, it gets a little difficult. Until now. Into the breach steps Dark Horse's new adjectiveless Star Wars ongoing series by Brian Wood (The Massive, Conan the Barbarian) and Carlos D'Anda (character designer of Batman: Arkham City and artist of its spinoff comics), a continuity-lite title that takes place in the timeframe between the end of A New Hope and The Empire Strikes Back. The first issue released this week is a promising start for the latest Star Wars title from Dark Horse, full of familiar faces in new, exciting situations set in a period largely unexplored for these characters.Being a first issue set in a simplified Star Wars universe, there's a lot of information tossed around, but Wood and D'Anda manage to tuck most of that into scenes that not only deliver exposition but also communicate a lot about where the characters are in an emotional context. I really liked seeing Luke feeling a little lost, because after all he's just a farm kid who met some weird old wizard whose ghost helped him squeeze off a lucky shot that blew up the biggest symbol of fascistic oppression in the galaxy. 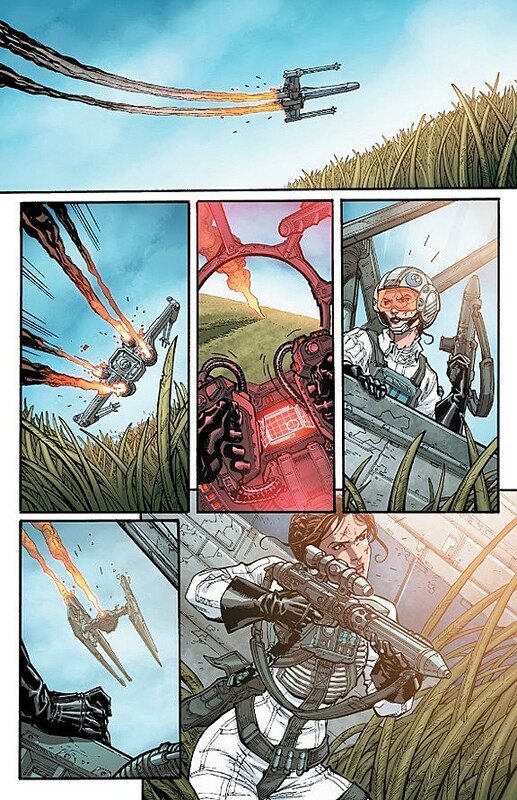 The real standout character of the first issue is Leia, however, as she channels the grief over the loss of her homeworld into a redoubled effort to stop the Empire. You remember that this is the same plucky diplomat who insulted the guy who showed up to rescue her from Lord Vader's secret torture cell and basically told a Grand Moff that he smelled bad -- to his face. 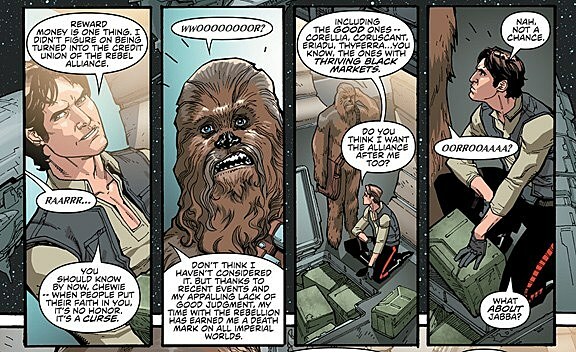 While Han and Chewie have a brief scene, their introduction has a neat twist as well, leaving questions about just how much of Han's old life is going to come back to haunt him as he transitions from smuggling scoundrel with a death mark on his head into a new life as a hero of the Rebellion. That's not an easy switch to make, and I'm looking forward to that transition playing out. 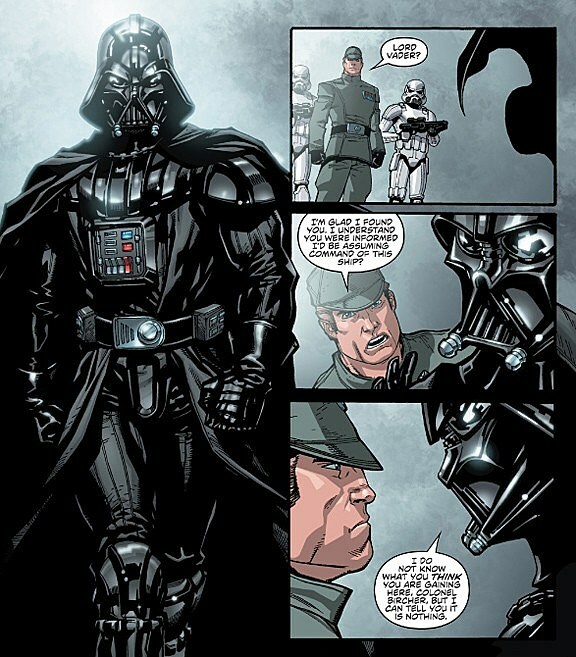 The most exciting story arc is Darth Vader's. Disgraced after the defeat at Yavin IV that resulted in the destruction of the Death Star, he's chided by the Emperor and given a new boss who doesn't seem like the type to let some religious fanatic in a black leather suit push him around. Vader's cornered and angry and wants revenge. Add to that the fact that the kid who blew up the Death Star has the last name of "Skywalker," and you got yourself a stew. All this is helped along by D'Anda's representation of Vader as a towering behemoth whose facemask has hints of the more angular Ralph McQuarrie concept art for the original Vader, which lends an extra air of menace to the Dark Lord of the Sith. Wood's been putting out some quality work on Dark Horse's The Massive as well as its licensed Conan comic, though his tendency to over-caption sequences crops up here as well. There's a dogfight scene that gets halted just as it begins by an "opening crawl"-style description of the Empire and the Rebellion that doesn't add a lot to the scene. In the end it's a minor complaint; Wood knows the universe and, more importantly, the characters. D'Anda's comics work is new to me, but he has a dynamic style that has the movement a Star Wars comic needs. His storytelling is clear and workmanlike for the most part, but there's a wordless two-page sequence with Leia on a planet's surface that doesn't flow as well as it could, with the payoff of the scene hampered by a couple of weird panel choices. D'Anda's ability to draw stylized, recognizable likenesses and to deftly render iconic spaceships and technology forgives any missteps, though. Style-wise, he sort of reminds me at times of a reigned-in Tradd Moore and at other times of early Leinil Yu. He's inking himself and for the most part, it works, though there are times where some unnecessary hatching obscures rather than enhances some sequences. My biggest complaint with trying to do Star Wars in comic form is the fact that the films use sound as a huge storytelling tool, with two main characters -- Artoo and Chewbacca -- communicating entirely through sound effects, and another -- Threepio -- with a heavily affected and processed voice. Michael Heisler's work here is fine, but when you think of the latest Simon Roy issue of Prophet, with weird glyphs that stand in for alien speech, or the way James Stokoe nailed Godzilla's screech in the first issue of his Half-Century War miniseries, you can't help but wonder if that extra lettering effort would pay off here. The inclusion of characters like Mon Mothma and the Emperor, who don't fully show up until Return of the Jedi, allow for characters and lore from the rest of the Original Trilogy in addition to the Expanded Universe. Which means that we just might get to see Lando Calrissian in this series. Of course this also means we might see Dash Rendar, and that guy is just the absolute worst. Let's start the letter-writing campaign now: Put Rendar in the blendar! We demand-o Lando! In the end, Wood and D'Anda created a comic that feels like Star Wars. The characters and dialogue ring true, the situations are set up to showcase different sides of the icons, Vader is menacing and cornered and dangerous, the story possibilities feel wide open, and yeah, they even sneak in the requisite "I have a bad feeling about this" line that I think is legally required in anything Star Wars-related. It just might be the most Star Wars-y comic I've ever read, and I have read more than a few. Between this and the recently-announced Legacy relaunch, I'm excited for Star Wars comics for the first time in a long time. Star Wars #1 is on sale now in your local comics shop and digitally from Dark Horse Digital.